Newt Gingrich: The American People Chose Trump But 20 TV Executives Are Rigging The Election [VIDEO] - Joe.My.God. Former House Speaker Newt Gingrich stood by Republican nominee Donald Trump’s claim that the election is being “rigged,” blaming what he calls “the unending one-sided assault of the news media” on the GOP candidate. 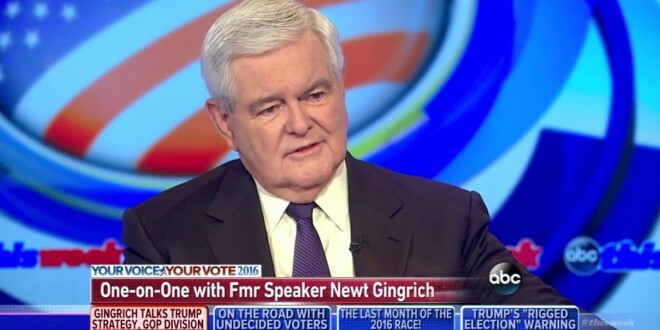 “Without the unending one-sided assault of the news media, Trump would be beating Hillary Clinton by 15 points,” Gingrich told ABC News’ Martha Raddatz on “This Week.” “So to suggest to us that people who are concerned about honest elections are somehow nutty, I think is a mistake,” he said. “I remember when Richard Nixon had the election stolen in 1960, and no serious historian doubts that Illinois and Texas were stolen. So to suggest that, we have, you don’t have theft in Philadelphia is to deny reality,” Gingrich said.